Students in Arviat, Nunavut, Canada, interviewed local elders and studied traditional skills as part of the Arviat Iglu project. In the process, the kids used technology tools of the present to learn about the past and to preserve it for future students. Included: Student interviews with Arviat's elders. Students from Arviat in Nunavut, Canada, recently became amateur historians and reporters as they interviewed local elders about the Inuit way of life. The interviews were part of a community-based effort to create a Web site preserving Arviat's heritage and the Inuktitut language. "This idea was developed because the community identified training in the technology field as a priority," Shirley Tagalik told Education World. "Another community priority was to preserve traditional knowledge. The Web site allowed us to do both things in one project." As the manager of Education-Nunavut's Early Childhood & School Services Division, Tagalik coordinated the unique Arviat Iglu project. The Arviat Iglu Web Site was the first of its kind. Designed to be a resource for students and teachers, the site contains information about the traditional way of life of the Inuit people, including their homes, heritage, and region. One portion of the site highlights Levi Angmak Iliniarvialaaq Elementary School's "Classroom in the Iglu" project. 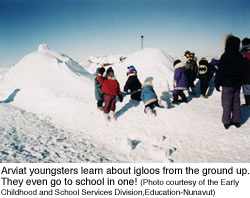 In this annual activity, students learn to build an actual igloo. Once construction is complete, the students travel each day from their classroom to the igloo, using it as an authentic alternative classroom. The students study traditional skills and carry out activities typical in an Inuit winter camp. Another section features interviews students conducted with Arviat elders. The firsthand accounts of the elders' life experiences were published along with digital pictures taken by the student interviewers. Together, the photos and interviews provide a glimpse into how the Inuit society has changed over time. One of the most compelling sections of the Arviat Iglu Web site contains the student interviews with various elders. One Arviat elder, Annie Sewoee, explained to a young reporter how authorities removed her family members from their tribal home and brought them to Arviat in 1986. Their tribe was starving and there was a shortage of animals to hunt. The student interviewer recorded Sewoee's anxiety over the new situation: "Annie was so used to living in Ennadai Lake that she was afraid they wouldn't survive without trees for wood, caribou and birds for food, and that the water was bad. After awhile she got used to the new land and knew that they could survive." Another elder, James Konek, told the students about how his family spent the summer traveling to different locations by kayak. During the winter, they walked! After he was taken with his family to Arviat by plane, Konek was faced with the decision to stay or return to his homeland. The student wrote, "James made the choice to stay. He learned all about being a man, hunting, helping, and showing respect. His father taught him. James was very open-minded and willing, and he is also very patient." Anita Iblauk has lived her entire life in Arviat. She described the experience of moving from living "on the land" to a heated home, a change she never anticipated. She admits that she wouldn't want to go back to her former lifestyle now, but feels that the difficulties she endured have strengthened her. "It must have been hard, especially moving from igloos to heated houses," observed her interviewer. In keeping with the goal of preserving the Inuit language, the Arviat Iglu Web Site provides information in both English and Inuktitut. "Key to us was the need to get Inuktitut onto the Web, so students could see their own language on the Internet," Tagalik said. 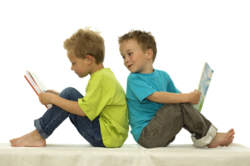 "We also sought to promote reading in Inuktitut. We made sure there was material in English, but the material in Inuktitut is not a translation. It is all original material." Tagalik and her colleagues hoped that by creating their first Web site with Inuktitut, local students would discover that theirs is a living language that can be just as "cool" as English. Publishing the pages in Inuktitut also made the Internet accessible to community elders, encouraging all Inuit to read every page of the online material. To achieve the project goals, students were assigned to work in various capacities. Their activities included Web page design, researching, interviewing elders, and other activities such as scanning, creating layouts, and storyboarding. "The most rewarding part for me was interviewing the elders," says May T., a student who contributed to the Arviat Iglu Web site. "I learned a lot about the past and how different groups lived in different shelters. I learned so much from them and I enjoyed it a lot." May wrote questions from a student's perspective and recorded the responses and personal stories of the elders. She did local research, typed the stories in Inuktitut and English, and took digital pictures of the elders. "I'm hoping that visitors to the Web site will learn all about the different kinds of shelters that Inuit used throughout the year," May explained. "I also hope that the Inuit who visit this site read the Inuktitut pages, not just the English pages. That way they can improve their Inuktitut reading skills." The creation of the Arviat Iglu Web site was truly a community effort. Several organizations contributed to its establishment. The Arviat Historical Society provided archival material and equipment and assisted with planning and identifying the elders to be interviewed. The Donald Suluk Community Library and other regional territorial organizations facilitated the completion of the project. The Community Access Program Web site was the host site for the project. The Arviat District Education Authority was the sponsoring agency for the site and handled payments and payroll for summer employment. Funding was provided by a number of partners and technology expertise was provided by the schools and adult educators. The Arviat site was published as part of Canada's Digital Collections, a program that provides opportunities for Canadian young people to learn Web skills by producing sites about their country. It also affords cultural institutions and other organizations a chance to improve access to their offerings. Eric Anoee, a media specialist who served with Tagalik as part of the Web team, recalled that at the start of the project the students were told that their Web site would be seen and noticed both by their own community and throughout the world. That prediction appears to be coming true! "The community members have been impressed with the Web site," said Anoee. And, through their involvement with the Web site, elders and students of the community of Arviat in Nunavut, Canada, have been encouraged to pursue technology interests. "We knew that the students and elders would really get a lot out of the project, even if we never got the Web site finished," Shirley Tagalik noted. "What we didn't expect was that the elders would become so interested in the technology they'd actually begin to take computer courses. That was a fantastic surprise!" "People from around the world, in Iceland, Sweden, and other places, have also seen the Web site," Anoee added. "[They've] been impressed by what people from such a remote place can create!" Here visitors can tour online exhibits designed to promote the Northwest Territories' cultural heritage.